What makes Greenawalt Roofing Company your best choices for your roofing needs in 30 seconds. Greenawalt Roofing Company is very proud to offer residential roofing services to homeowners in Lancaster, Reading, York, and Harrisburg. Your home is one of your largest investments and its roof should protect that investment. At Greenawalt Roofing Company, we ensure that protection by using only the highest-quality asphalt shingles and underlayments. By choosing Greenawalt Roofing Company, homeowners can be confident that their job is in good hands. Our installation crews are all committed to performing quality installations. We’re so confident in our installation teams that we offer a 12-year workmanship warranty on every job. That's 144 months of protection! Our roofing experts recommend TAMKO® architectural shingles, a leading manufacturer of roofing shingles that offers 30-year and 50-year limited lifetime warranties on their roofing systems. TAMKO offers the longest upfront protection -a full 15 year coverage period vs other standard warranties. We're committed to customer service. At the end of the day, we want our customers to be happy. We value honesty and understand the importance of trust. Customers can be confident and comfortable when they work with us. We're not going to sell you a roof if you don't need it. From the initial assessment to the final billing, we prioritize quick call backs, prompt estimates, being thoroughly informative and easy to reach. We're not available 24/7 but we don't necessarily go off the grid after 5pm either. We're here for you. A wide variety of shingle color options are available to complement any home’s style. With every shingle installation, we also recommend installing Raptor™ synthetic underlayment for exceptional performance. Our underlayment also comes with a 25-year warranty from the date of installation or until the overlaying roof materials are disturbed or removed. Does your home have flat roof areas? In addition to the installation of shingle roofing systems, we also specialize in rubber roofs that provide protection over the flat roof areas that you may have on your home. Our residential customers don't have to pay anything up front either. There is no money down at signing. Everything is due upon completion. We make sure the work is done to our customer's 100% satisfaction before we deliver the bill. After-all, we're locally owned and operated. It's our reputation on the line. Contact us today for A FREE ASSESSMENT of your home’s roof. We’ll provide a free assessment and give you an honest feedback on your roof’s condition. We’ll even tell you if your roof is still able to provide adequate protection for a few more years. We can help you make an informed decision. We are trusted by local home builders as their roofing contractor of choice. When you choose Greenawalt Roofing Company, all hands on deck at your new home site are exceptionally skilled workers who take pride in their work. Call us during business hours and Connie will schedule a time with one of our experience sales reps for your free estimate. If you email or call after hours, we'll often respond first thing in the morning on the following business day. Without making our sales team work 24/7, we'll find the most convenient time for our customers for a site visit. One of our experience sales reps will drive to your home for your free estimate. Our team member will introduce himself and show you our product offerings along with other information in an organized packet. From start to finish, the initial assessment will take anywhere from 30 to 45 minutes in most cases. After the introduction, our team member will set up their ladder and climb onto your roof to take measurements and visually inspect your roof's condition. Photos to show the customer of any area or areas of concern may also be taken at this time. Once finished measuring and inspecting the roof, our team member will discuss the situation, provide options, and answer any questions. If replacement is needed, we will explain the whole process including tear off, installation of felt paper and shingles, new edge metal, replacing any vent collars, gutter clean out, running magnetic nail sweeper, etc. This is also a time that they can answer any questions you may have about the overall re-roofing process. Don't expect to pay anything until the job is 100% complete and we've delivered on all our promises of quality service and professionally installed materials. In some cases, this can be as quick as calculating everything on site with our mobile device, but most of the time, customers should expect an email with the estimate the same or following business day. We will also send a hard copy of the estimate in the mail within a business day. Once you sign a contract with us to install your new roof, depending on the season, expect completion of your project anywhere between 3 week and 6 weeks. 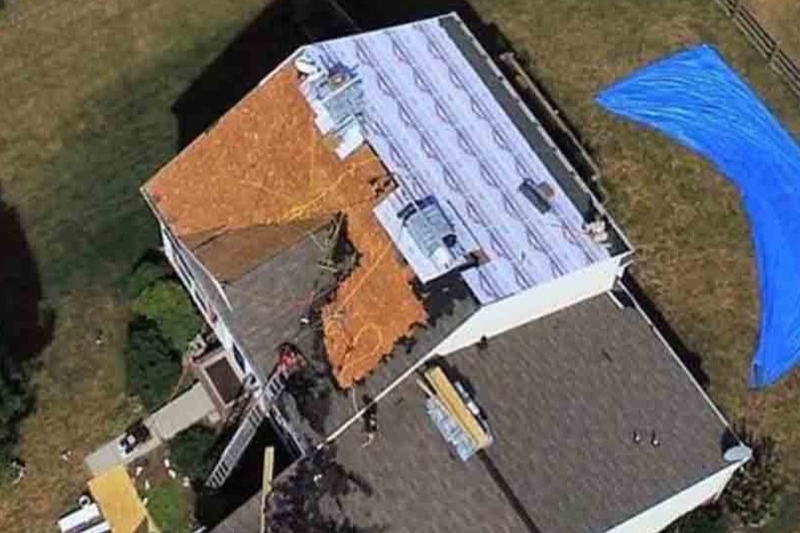 We do our best to get to all of our roof installations as quickly as possible but we are at the mercy of the weather and some times our schedule can get backed up quickly if we miss a few days due to rain or snow. We take all necessary precautions to ensure your lawn, landscaping, and other parts of your property are left undamaged. We also know that mistakes can happen from time to time and always make things right. We take care of our customers! If our sales reps schedule accommodates, he'll visit you with the post-job crew where he'll cover warranty information with the customer and deliver the first and final invoice. Everything is due upon completion because we don't require a down payment. We make sure the work is 100% satisfaction before we bill you. If the customer chose financing, we finalize the financing and the customer has 30 days from the date of completion to the first payment due. We use ENERBANK for financing. We offer 9.99% financing to all of our customers. Ask us about this option if you're interested. We would love to stop out and give your roof a free inspection so that you can plan to take the right next step when the time is right.